Both the Ethiopian Airlines crash and last October’s Lion Air jet crash were of the same Boeing 737 Max make, and faced similar erratic flights before crashing. 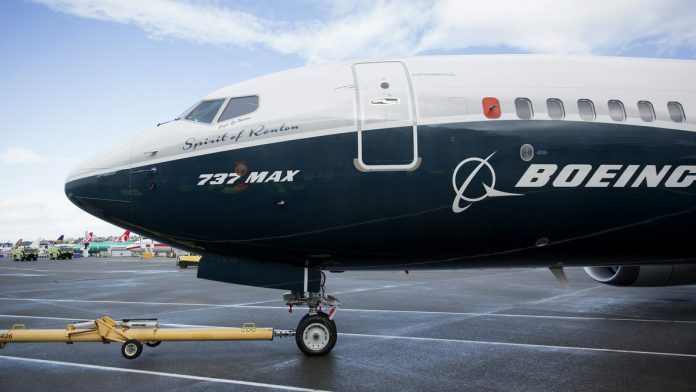 Washington: Once again, an almost brand new Boeing Co. 737 Max 8 crashes not long after takeoff as it flies erratically and pilots ask to return to the airport. The crash Sunday morning of a jetliner in Ethiopia bears unmistakable similarities to the 29 October tragedy off the coast of Indonesia involving the same model, prompting questions about whether a design issue that arose during the earlier accident could be to blame. China ordered its carriers to ground all 96 of its 737 Max jets, while Indonesia said it would also halt flights after Ethiopian Airlines Flight 302 went down in a field shortly after takeoff Sunday, killing all 157 people on board. The US Federal Aviation Administration, which originally certified the 737 Max, said it was in the early stages of its investigation and has seen no evidence there is a link between the two accidents. It issued a notice Monday to other nations saying it saw no need to ground the plane but said it would mandate design changes by April stemming from the Indonesia crash. The stakes for Boeing and one of its most popular models are enormous. But veteran crash investigators and the airline say there’s too little data to draw a direct tie between the two at this stage of the investigation. U.S. pilot unions, who were critical of Boeing after the Indonesia accident for withholding information on design changes in the 737 Max, were also cautious. “We would never speculate on the accident or anything at this point because it’s just too new,” said Jon Weaks, president of the Southwest Airlines Pilots Association, said Sunday. Flight ET302 took off from Addis Ababa about a little before 8:40 a.m. local time and went down about six minutes later, killing all 157 aboard, according to a statement from the company. Its crew had reported an unspecified problem and asked to return to the airport, airline Chief Executive Officer Tewolde Gebre Mariam said at a press conference. The plane’s initial flight track was very unusual at a time when airliners typically climb steadily to get safely away from terrain and to reach altitudes where engines burn more efficiently. He cautioned against drawing conclusions however. “At this point, it’s just too early,” he said. The Ethiopian plane’s speed and the fact that it didn’t climb much were also highly unusual, said Roger Cox, a former investigator with the National Transportation Safety Board who was also an airline pilot. Cox compared the flight path to a plane in an airshow, which intentionally stayed low to the ground and flew at a high speed. If the FlightRadar24 speed estimates are correct, the plane was traveling at more than 440 miles per hour during its brief flight. It had only climbed 1,400 feet from the runway two minutes after lifting off. Because the Ethiopian plane was apparently out of range of FlightRadar24’s Addis Ababa ground station, the flight track doesn’t include the last few minutes of the flight, including its final dive. Photos of the wreckage indicate it hit at a high speed and broke into small pieces. Investigators have recovered the cockpit voice and flight-data recorders, Ethiopian Airlines said Monday, a significant step forward in piecing together what happened. Lion Air Flight 610 dove into the Java Sea in October about 11 minutes after takeoff as pilots struggled to handle a malfunction that prompted MCAS to repeatedly command a dive. All 189 people aboard died. While Indonesian investigators have identified multiple failures of the airline’s maintenance and raised questions about the pilots’ actions, one of the factors under review in the investigation is Boeing’s design. The FAA is working with the Chicago-based planemaker on a design changes and upgrades to its pilot training manuals to reduce the chances that such a failure could cause an accident in the future.